Churen Himal Treks & Expedition - leading organizer of expedition, trekking & tours in Nepal and Tibet. 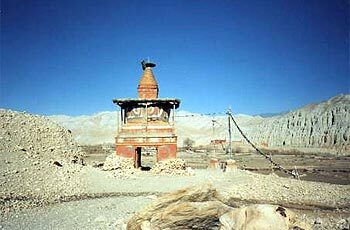 Often described as the hidden or lost Tibetan kingdom, Nepal’s Mustang presents one of the last intact vestiges of Tibetan Buddhist religion, culture and lifestyle unchanged in centuries. Trekking to Mustang is a journey beyond the Himalaya, a journey to one of the most remote kingdoms on earth. Starting at Jomsom in the Kali Gandaki valley, the trek passes through a barren, desolate landscape carved deep by cayons, until the walled capital city of Lo Monthang is reached. Filled by a maze of narrow lanes and streets, the city presents a medieval setting with its ancient place, monasteries, and temples. This is an amazing experience that allows one to step back in time. Churen Himal Treks & Expedition Pvt. Ltd.
All of content on this website are the property of their respective owners. Duplicating any part of this website without permission is illegitimate task. Copyright © Churen Himal Treks & Expedition, 1998 - 2018.